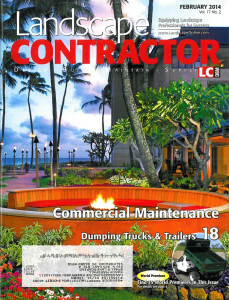 A growing corporate trend that is more than welcomed by the landscaping industry is an emphasis on creating green spaces, not just for appearances sake but specifically to enhance working conditions, which then helps improve a company’s bottom line. Studies bear this out. Employees with access to green areas reports more job satisfaction, less job pressure, even fewer headaches and other ailments than workers without green spaces to enjoy. And with this comes increased productivity. Chicago decking, a steel erection company in Merrillville, Ind., was hoping for these results when they enlisted Smalls Landscaping to create a nature-rich, employee break area. 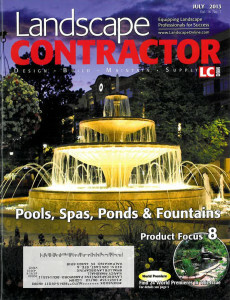 The Valparaiso, Ind., firm was responsible for all aspects of the project: designing and building a fully landscaped area highlighted by a natural-looking waterfall and a fishpond. The family in the Dyer, Indiana, residence wanted to create a private backyard entertainment area with a pool, outdoor kitchen, fire pit, multiple seating areas, fishing pond and dramatic water features surrounded by lush, colorful landscaping areas. Crafting this design combined the needs and personal style of the client with streamlined function in a visually arresting space. Challenges were many. The house sits on a long and narrow lot, with a single access to the rear yard. The septic system could not be relocated, forcing crews to work around it as well. An existing five-acre pond was too shallow to support fish, which the owners wanted to add. The front yard had a considerably low grade. 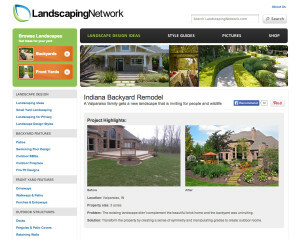 La PORTE – With more than 30,000 different trees and varieties of flower species, Small’s Landscaping isn’t so small. Originally established in La Porte, Small’s now conducts business at their massive nursery at 310 North 325 East in Valparaiso. 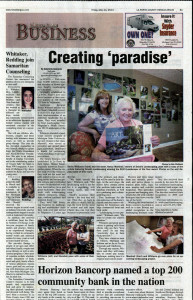 Landscape designer Becky Whitacre and her sister, Nancy Marshall, recently received a high honor for their implementation of an elaborate landscape for a home. 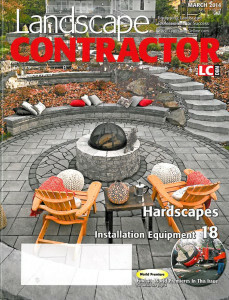 They were awarded as Total Landscaping Care Magazine’s North American 2013 Landscaper of the Year. A Valparaiso family gets a new landscape that is inviting for people and wildlife. Problem: The existing landscape didn’t complement the beautiful brick home and the backyard was uninviting. Solutions: Transform the property by creating a sense of symmetry and manipulating grades to create outdoor rooms. The contractor installed 13 lights in this area. 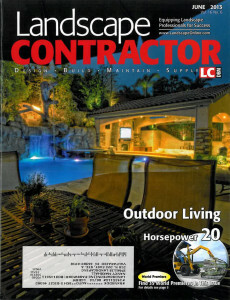 The front of the house is illuminated using six Kichler 4.5-watt LED low-voltage directional spots. 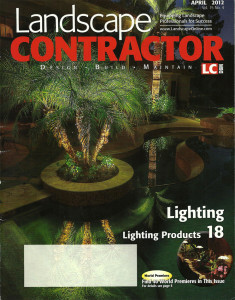 Lighting for the ground cover area comes from 4.5-watt “Hammered Roof” path-lights spaced 15 feet apart. Both lighting sets get their power from a 300-watt transformer located on the right side of the house. The large pots by the front walkway were accented with 4.5-watt, 60-degree directional LED spots. Workers planted Japanese Maples and Hicks yew hedges along the house, as well as Mazus Reptans ground cover and Hackonechloa Aureola grasses in the front yard.